Truman went to R Place for his skillet. Stopped at grain elevator to get a bucket of corn for the squirrels. Water elevators are hurt by the boxcar. The per bushel price for corn and beans took him by surprise. Truman fed me math fodder on Father Day’s 02013. It’s May 4th and my last posting was five days ago on April 29th. Summer break is approaching and I don’t know how much time this blog is going to get. Only time will tell (Duh! I know). It’s graduation season. I’m excited about the future is a frequently encountered phrase and everytime I hear it I’d like to ask Why? I use the phrase frequently because I am excited about the future. Why? Because I’m a futurist and that’s exciting. ChangeTheEquation.org has a posting titled “STEM Help Wanted”. The posting was about jobs, but again the STEM acronym sent me on a STEM, CSTEM, STEAM, CSTEAM, SCREAM detour. Switch STEM to SCREAM and the CTEq headline morphs into SCREAM Help Wanted. SCREAM includes ‘Computing’ and ‘Robotics’. Scream “Help Wanted” and it morphs into a HELP WANTED scream. I’ve been celebrating Pi Days since 02005 and I’ve come up with Pi Day 02012 Plan. My goal is to celebrate Pi Days up through 02016 and then self publish a book documenting my Pi Day experiences. Binary date and time… If we’re naughty and use a 2-digit year, then 11/01/10 (today) is a binary date. In the DD/MM/YY format 01/11/10 is palindromic. [Note: DD/MM/YY format is popular outside of the United States.] 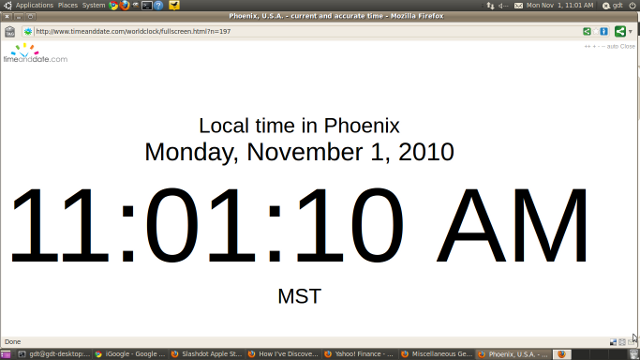 I’m looking forward to 11/10/10 and 11/11/10, which will be the last binary dates until 01/01/11. Pi sighting… The Arizona Republic reported that Arizona has “3.14 million registered voters.” 3.14 is Pi rounded to the nearest hundredth. going to inject 100 nanograms of drug. Tweet milestone… On 02010.10.30 my @mathbabbler tweet counter hit one kilotweet. It took 509 days to reach that milestone. Date and time I told them so… Last week during my “Computing Science for Non-CS Majors” course I giving an overview of the functions that come with STDC (Standard C) Library. I mentioned that C and C++ don’t provide direct support for date and time processing, but that the STDC Library comes with a collection of date and time functions. I told that class that I would be covering some of the date and time functions because programming date and time is hard. Today, on 1 November 02010, @slashdot tweeted the following. I had an Intermediate Algebra class on 11 October 02010 that started at noon. Prior to class I had read a press release from Geron Corporation announcing the “enrollment of the first patient in the company’s clinical trial of human embryonic stem cell.” I made mention of this historic moment near the start of the class and I had to immediately change the subject. We solve for ‘x’ in this class. Prior to this embryonic stem cell moment, I had presented the QOTW (Quote Of The Week). I briefly mention how the way we use computers today can be attributed to Doug Engelbart’s work back in the 1960s. I also mentioned that Engelbart is alive and still working on his lifelong dream of augmenting human intelligence. Student: What do you mean by augmenting human intelligence? Me: Make all people equal when it comes to IQ. Student: What?!?!? How do we do this? Me: Well, one example, the Googlers want a Google object implanted in our brains. Student: What?!?!? Won’t we be like robots? Me: We solve for ‘x’ in this class. Search Google for site:wired.com bill joy future and read Why the future doesn’t need us. Prior to this embryonic stem cell moment, I mentioned that is was nice having two binary dates in a row. Yesterday was 10/10/10 and today was 10/11/10. Next month will be fun because we have 11/11/11 and 11/11/11 will be the last binary date until 1 January 02100. I wasn’t able to move of this topic until I pointed out the blasphemy of using a 2-digit year. Me: I should be shot for using a 2-digit year. If anything, we should be using a 5-digit year. Me: Yes. 2010 is really 02010. But you don’t want to start using a 5-digit year because that will put you completely out-of-sync with the rest of society. Student: Nobody uses a 5-digit year. At the very start of class (i.e. prior to this embryonic stem cell moment), I mentioned that The Simpsons last night was a mathy episode (Lisa coached baseball using statistics/probability) and I tweeted about it. At this point the energy level of the class started its fall to zero because it was time for us to solve for ‘x’. Truman is my dad. My birthday is at the end of May and Truman’s birthday is near the end of June. I turned 50 during May of 2007 and Truman turned 80 during June of 2007. Now for number system tidbit… 50 in base-16 (hexadecimal, or hex) is 80 in base-10 (decimal) because five units of 16 plus zero ones equals eight units of 10 plus zero ones. In many programming languages, numbers prefixed with 0x (or 0X) are numbers being represented in hex. For example, 0x50 is 80, 0x51 is 81, 0x52 is 82, 0x53 is 83, …, 0x59 is 89. Now to the point of this posting…During my 6th and Truman’s 9th decades of life, for 11 of every 12 months, my age in hex equals Truman’s decimal age. When Truman and I turn 90 and 60, respectively, my hex age will no longer equals Truman’s age (i.e. 0x60 is 96, not 90). Note: This posting was published when I was 53 and Truman was 82 (i.e. my age in hex was one more than Truman’s age in decimal).